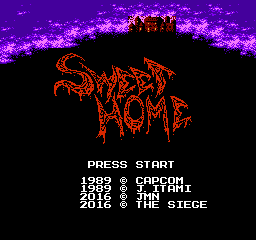 This is a really nifty RPG by Capcom that is precursor to Resident Evil. What makes it interesting is that the game places a greater emphasis on puzzle-solving than fighting, which makes for an interesting change of pace. Actually, you are far more likely to die in the game itself than in a battle. 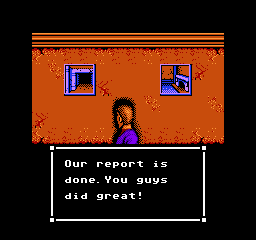 Wandering around is what you’d expect in any Nes RPG: over-head, tile-based movement. You use a variety of items to solve puzzle in this environment, while randomly encountering enemies. The graphics are really nice, too. 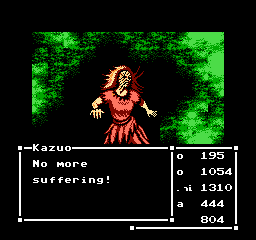 The overhead graphics almost remind of Quest of the Avatar for some reason, and the battle graphics and portraits look really nice for the Nes. It’s a great game. 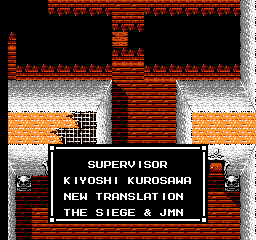 Created by JMN and The Siege, this translation aims to be much more accurate to the original source material, and much more presentable. It restores some elements from the movie that were lost in the first translation like the Amulet. With this patch, the game should be able to be completed without the use of an external guide. DISCLAIMER: The game will crash if you examine the statues before confronting Mamiya the first time. Don’t worry, the game can still be completed.